There has been much talk in recent years about our soil biology and how it can help pasture and crop production. A plethora of information and products claim to improve our soil biology. Add to this the issue of soil carbon and soil biology can become complex and confusing. So what is soil biology and how does it help our production? Soil biology starts with carbon. Humus present in the soil provides food for the most basic single-celled animals, which then provide a food source for the next animals up the food chain and so on. The interactions between life, predation, death and decay of these animals in the soil make up the complex system known as a soil food web. The soil food web describes the basic relationship between all levels of life in the soil. The photosynthesis and growth of plants provide the basis for this food chain, where the ultimate consumers are grazers and predators. In turn the waste products of the higher level groups as they live, die and decompose provide food for the plants. 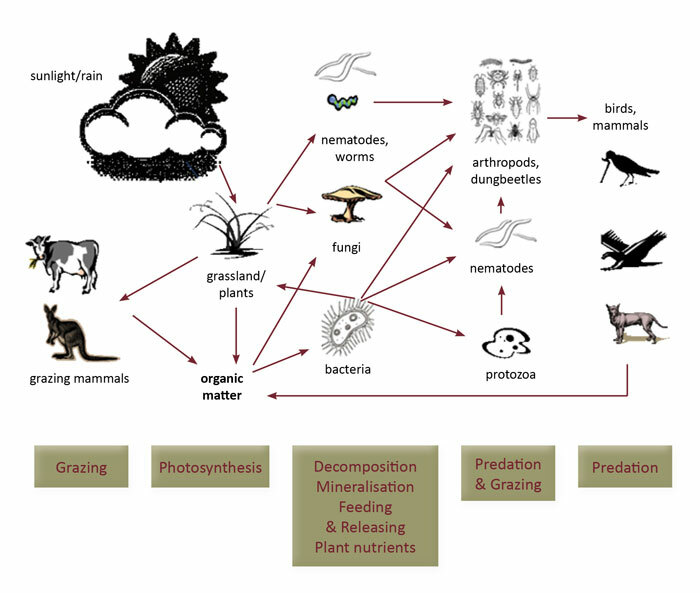 In some cases the loss of one animal or plant species from the soil food web can lead to a breakdown in the whole cycle. The sheer mass of soil organisms is remarkable. Research at Beverley in Western Australia found approximately 800 million protozoa/m2, 900,000 nematodes/m2 and 130,000 mites/m2 in soil under pasture. In New South Wales research on cropping soils found 486kg/ha (carbon) of microorganisms to a depth of 30cm in a stubble paddock. This equates with more than 1 adult-equivalent beast grazing in the top 30cm of soil per hectare. In general, the more biological life in our soil, the greater the potential for improving or maintaining current production levels. soil may be disturbed by erosion, vehicle traffic and tillage. Claims are made for the effectiveness of many products and practices, such as compost tea, for increasing soil biology. Some studies on cropping soils have found that minerals will increase the diversity of soil biology simply because there are different substrates for the soil organisms to live on. In general, however, there has not been a great deal of research in Australia. The websites below provide considerable information on a range of practices and products should you consider undertaking a small-scale trial on your own property.